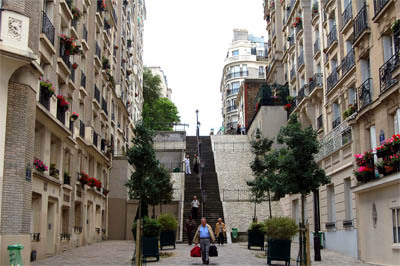 Nothing illustrates better the vast urban growth of Paris since the XIXth Century than what happened to Montmartre: nowadays it is hard to conceive that in Berlioz’s time Montmartre was not part of Paris, but a separate village. To go to Montmartre was to leave Paris for the countryside. From the north-facing slope of Montmartre the eye could contemplate a vast expanse of open ground stretching out to the plain of Saint-Denis, but which is now entirely built up. 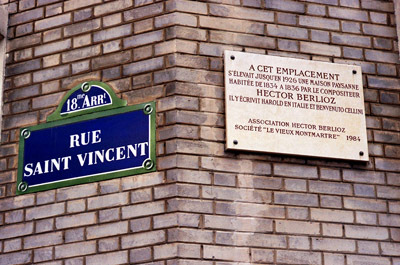 Berlioz and Harriet Smithson lived in Montmartre for a few months in 1834 and then in 1835-6, in a house located in rue Saint-Denis (later renamed rue du Mont-Cenis), at the junction with rue Saint Vincent, on the north slope of the hill. 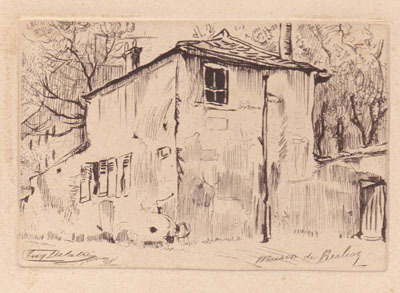 Although Berlioz lived there for only a few years, Montmartre was charged with personal associations, both happy and sad, and his letters provide detailed information about his life there; a selection of these for the years 1834-1836 is provided below (references are all to Correspondance Générale, hereafter CG for short). It was in Montmartre that the couple enjoyed the blissful start of their married life, greeted by exceptionally fine weather in spring and the early summer of 1834 (CG nos. 395, 397). Their son Louis was born there, on 14 August 1834, to the great joy of both parents and especially of Harriet, and christened on 23 August the following year (CG nos. 409, 454, 458). For Berlioz the period in Montmartre was one of intense activity: he completed there the symphony Harold in Italy (CG nos. 398, 408), initiated the opera Benvenuto Cellini (CG nos. 398, 453), and started composing a large work in celebration of France’s great men (CG no. 440); the work was not completed but probably provided material for later works – the cantata Le Cinq mai, the Requiem, and the Symphonie funèbre et triomphale. But much of his time and energy was necessarily taken up with his work as literary critic (CG no. 440), and it was in 1834 that his long association with the Journal des Débats started. 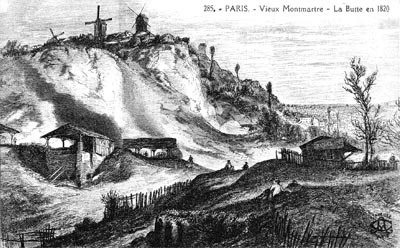 Montmartre had a number of advantages: the setting itself was idyllic with a large garden and a view over the plain of Saint-Denis, and Berlioz’s letters make frequent reference to this (CG nos. 385, 389, 394, 395, 435, 445, 458, 474). The cost of living was significantly lower than in Paris (CG nos. 385, 435, 445), and Berlioz was sheltered from unwanted visitors and interruptions (CG nos. 385, 445), though it was still possible to hold there social gatherings of the intelligentsia of Paris (CG nos. 396, 397, 445, 469). But Montmartre also had its drawbacks: Berlioz had to go regularly to Paris, and travel was arduous and expensive (CG no. 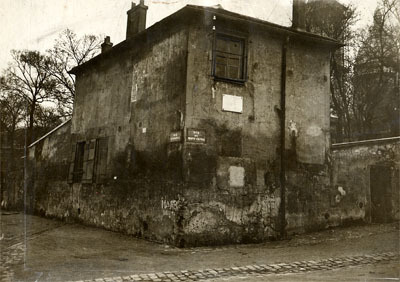 445); in winter Montmartre was isolated, Berlioz’s house lacked proper heating (CG nos. 454, 457, 458), and the servants were a constant source of trouble (CG nos. 439, 457, 458, 464). It was also in Montmartre that fundamental problems came home to the couple: their financial difficulties, Berlioz’s need to write feuilletons instead of being able to compose music (CG no. 440), and the inability of Harriet to pursue the acting career which had first brought her to fame in Paris (CG nos. 439, 464). It was thus inevitable that the couple should eventually return to Paris (35 rue de Londres). 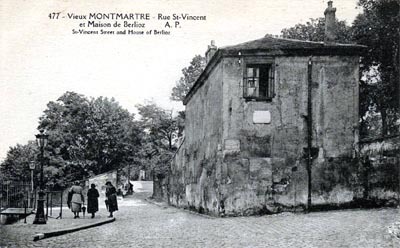 Berlioz never lived again in Montmartre, though it was to Montmartre (rue Saint-Vincent) that Harriet returned in 1848 after the breakdown of her marriage with Berlioz; she spent there the remaining years of her life until her death on 3 March 1854. 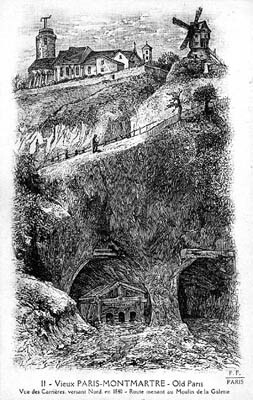 She was buried in the small Saint Vincent cemetery, on the north-facing slope of Montmartre, not far from where she and Berlioz had lived, though her remains were later transferred to the larger Montmartre cemetery (3 February 1864; cf. Memoirs, Postface). Chopinetto mio, si fa una villegiatura da noi in Montmartre, rue St-Denis no. 10. Spiro che Hiller, Liszt and de Vigny serano accompanied by Chopin. What silly nonsense. Too bad. H.B. […] I am writing to you from Alphonse’s place, where I dined with the Rocher family. I will hurry back to Montmartre, my poor Harriet is so unwell that she stayed on her own and I do not want to bother her to go out. Today she was better, may God wish that it lasts. By chance an English lady with several young children has come to the house where we live and she is of great help to Harriet. * By order of his mother I am writing a note here to add that he has a very beautiful brow, which is true. ** Second note by order of the mother; he has a well-turned body, his limbs are wonderful. *** Third order at Harriet’s command: many other French ladies and women from Montmartre have also stopped to admire Louis. […] We are in a house which is not far from Paris, but getting there is rather hard work; you have to climb up one side of the mountain then go down the other. The view over the plain of Saint-Denis, with on the horizon the tombs of the kings of France, the hills of Saint-Germain, Montmorency, etc., is truly magnificent. And when Adèle said to me in one of her letters that she wished me open air, she was wishing for me what I have in abundance. Our garden is fairly large; the sitting-room of our flat was once a pavillion built by Henry IV for the charming Gabrielle. It is an interesting antique which we have partly restored in modern style. Despite the extreme fatigue caused to me by my visits to and from Paris we will keep this place for the winter. Apart from the site and the low cost, it has another advantage to offer in sheltering us from the chore of putting up with visitors; those who have nothing to do think twice before coming to pester me and waste my time. […] Thank mother for her offer of a barrel of wine. We are not sure we will be staying much longer in Montmartre, and in any case the chore of getting the wine bottled, protecting it from robbers about whom we have a great deal to complain from every point of view, the cost of buying the bottles and paying for transport, all this reduces to almost nothing the advantage and saving to be made from this shipment. The jams on the other hand would be welcome; Louis likes them very much. This child is growing and rapidly becoming stronger; he does not speak at all as yet. But Harriet claims that when pointing to his dress he says very distinctly « Aunt » and I am instructed to tell this to you. Unless otherwise specified, all the photographs reproduced on this page were taken by Michel Austin in June 2001 and June 2008, and other pictures have been scanned from paintings, photos, engravings, lithographs, prints, postcards and books in our own collection. © Monir Tayeb and Michel Austin. All rights of reproduction reserved. This postcard is a reproduction of an 1820 engraving. 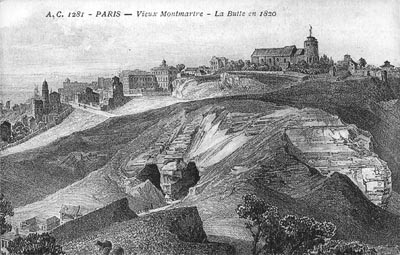 This postcard is a reproduction of an 1840 engraving, which shows the quarries on the north side of the slope. 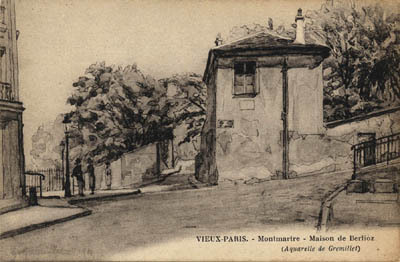 Two addresses are provided by Berlioz’s correspondence for the house in Montmartre. Letters of April and May 1834 give the address as no. 10 rue Saint-Denis (CG nos. 389, 392, 396, 399); Berlioz and Harriet stayed there until late September or early October when they moved back to Paris at no. 34 rue de Londres (CG nos. 409, 410). 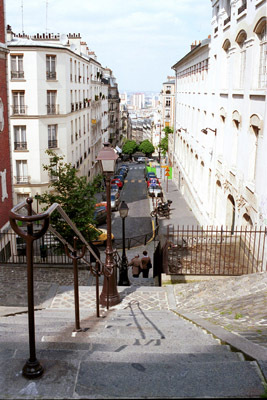 In May 1835 they returned to Montmartre where they stayed till September 1836 when they moved to 35 rue de Londres (CG no. 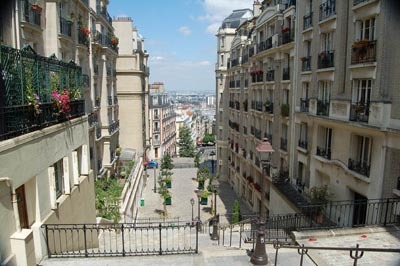 478-9), though Berlioz continued to use the Montmartre address till November (CG no. 482). 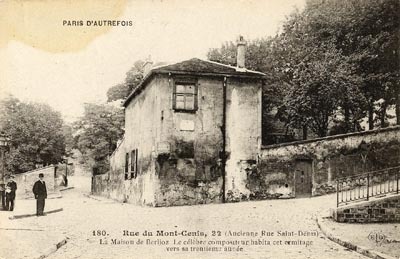 Letters of 1835 and 1836 now regularly give the Montmartre address as no. 12 rue Saint-Denis (CG nos. 436, 437, 439, 441, 467, 468, 477). There is nothing in Berlioz’s extant letters to suggest that nos. 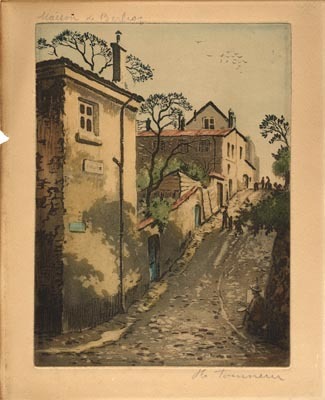 10 and 12 rue Saint-Denis were two different houses (the setting is described in identical terms throughout the period in Montmartre), and the evidence of engravings and paintings also suggests that the two addresses refer to one and the same house. The likelihood is that the number of the house was simply changed in the latter part of 1834: a letter definitely dated to September 1834 (because of its reference to Louis’ imminent christening) carries for the first time the address no. 12 rue Saint-Denis (CG no. 408ter, in vol. VIII). 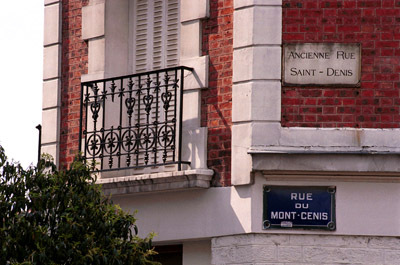 The original name of the street, rue Saint-Denis, was changed to the present one, rue du Mont-Cenis, in 1868. 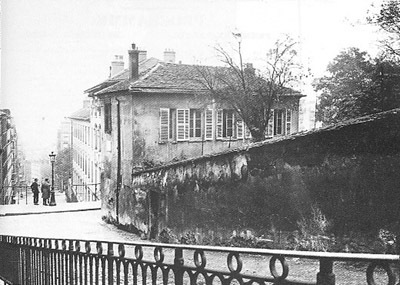 Berlioz’s house survived till the 1920s; several attempts were made in the early 20th century to preserve it and turn it into a Berlioz Museum, and though they failed they are worth recalling. 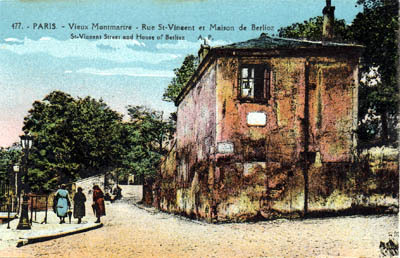 In 1908 a group of Berlioz enthusiasts, among them Henri Martin the father of Jacques Barzun, created the Fondation Berlioz, whose first action was a pilgrimage to the composer’s house in Montmartre on 13 December 1908, the composer’s anniversary, to inaugurate a plaque which recalled Berlioz’s time in Montmartre. 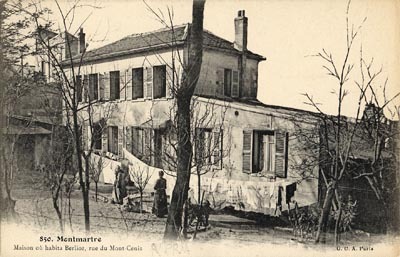 The pilgrimage became an annual event; for the year 1910 there are two accounts on this site of the pilgrimage of that year, one from Libre Parole for 12 December and the other from the Petit Journal for 13 December; both also mention for the first time the plan of turning the old house into a Berlioz Museum. 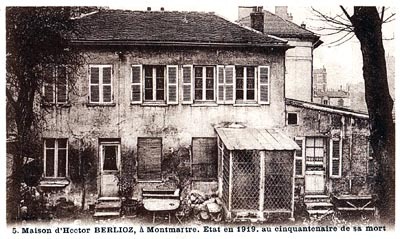 A few years later, in 1919, the plan is mentioned again by Jean de Massougnes in the name of his father Georges de Massougnes, a Berlioz champion of long-standing who had recently died: he proposed the purchase of the house by public subscription for it to become a Berlioz Museum. 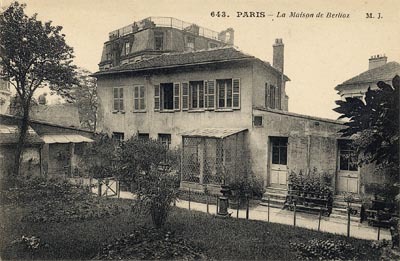 Nothing happened immediately, but in 1922 Mlle Barbier, who had already purchased the house of Balzac and turned it into a museum devoted to the writer, now acquired as well Berlioz’s old house with the same purpose in mind. The story is told briefly in an article of Comœdia of August 4th, and at greater length in an article in Annales of 27 August, which mentioned how Mlle Barbier was threatened with expropriation by the state, and spoke up warmly for the preservation of a house so rich in historical associations. 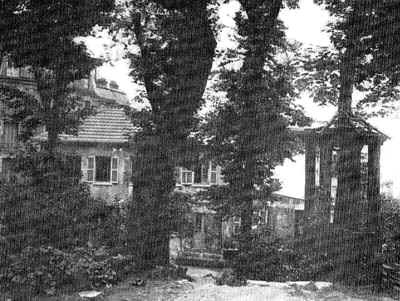 But in vain: the house was demolished in 1925 to make way for a large modern block of flats devoid of character. The site of Berlioz’s house is now no. 22 at the junction of rue du Mont-Cenis and rue Saint-Vincent, and it bears a commemorative plaque. This plaque dates from 1984 and replaces the original plaque which was inaugurated in 1908. 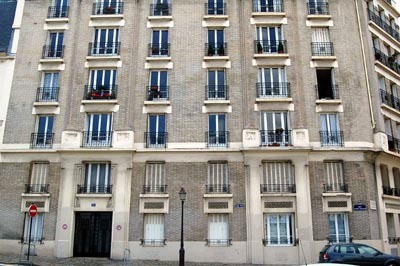 A number of medallions on the block of flats seem to be adapted from a XIXth C painting depicting the house in which Berlioz lived. 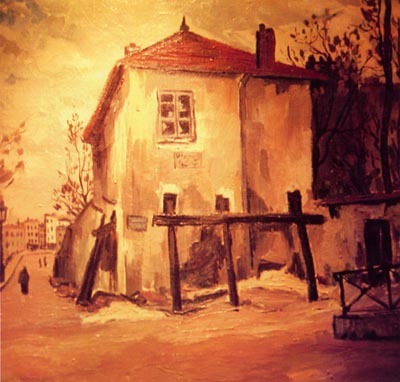 This painting by Sahut shows the house in which Berlioz lived in the mid-1830s as it was about 10 years earlier. 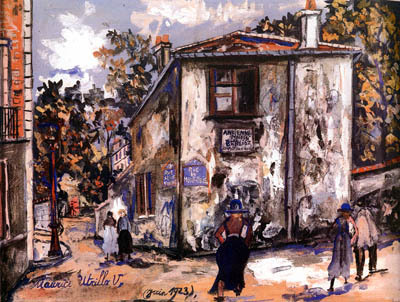 The original painting is now in the Musée Hector-Berlioz at La Côte Saint-André. We are most grateful to the Association nationale Hector Berlioz for granting us permission to reproduce the painting from Jean-Pierre Maassakker’s book, Berlioz à Paris, published by Association nationale Hector Berlioz in 1992. We are most grateful to Mr. Kirst Hulspas for sending us an electronic copy of this drawing in his collection and granting us permission to reproduce it on this page. This very old lithograph is by Maurice Tourneur. The commemorative plaque below the window is visible on the wall; it was installed in 1908. The above original photo dates from the 1920s. 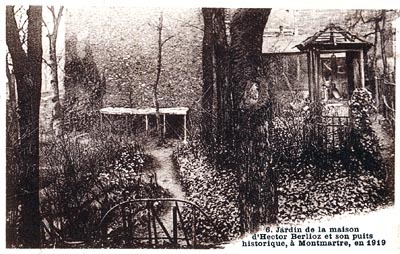 Berlioz entertained the elite of Parisian artistic and literary world in this garden, among them Chopin, Liszt, Hiller, de Vigny, Janin, Dumas and Deschamps (CG nos. 395, 396, 397). A copy of this photo is in the Hector Berlioz Museum at La Côte Saint-André. 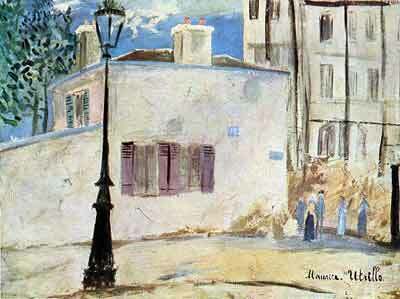 This is a reproduction of a painting by Utrillo on a postcard. 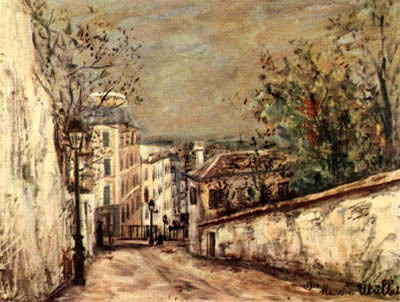 Utrillo’s painting shows the wall on the left still standing. 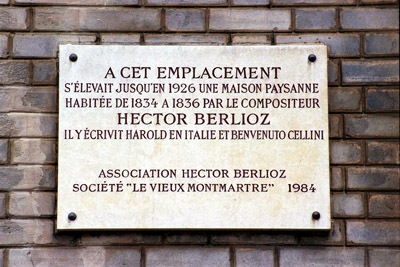 This plaque was originally installed in 1908 on the wall of Berlioz’s home, and was later reinstalled on the wall of the modern block of flats which replaced it (note that the date 1837 is incorrect and should be 1836). A new plaque later replaced this one in 1984. This picture was sent to us by Mr John Winterbottom to whom we are most grateful. This plaque dates from 1984 and replaces the original plaque of 1908. 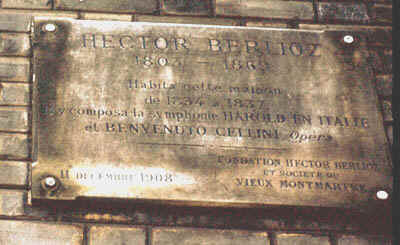 The plaque reads: ‘On this spot existed until 1926 a country cottage in which the composer Hector Berlioz lived from 1834 to 1836. He wrote there Harold in Italy and Benvenuto Cellini’. The latter statement is not quite accurate: the composition of Harold in Italy was started in January 1834 before the move to Montmartre, and Benvenuto Cellini was not completed till 1838, long after Berlioz had left Montmartre. This medallion is derived from a painting by Sahut of the house as it was in 1825 (see above). 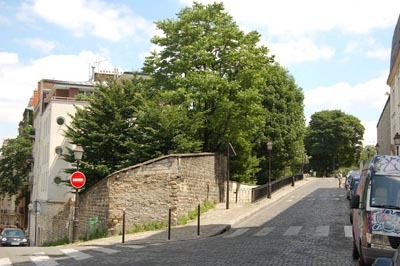 This view faces diagonally the site of the house of Berlioz. 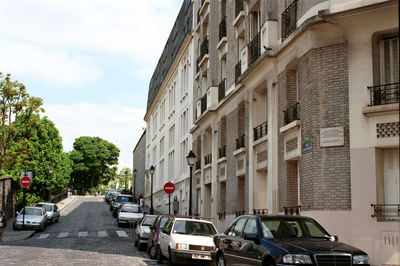 The block of flats in the foreground on the right at the corner of rue du Mont-Cenis stands on the site of Berlioz’ home. Nos. 11 and 11bis on rue Saint Vincent, which occupy the site of Berlioz’s home are on the right just off the picture (see next photo). 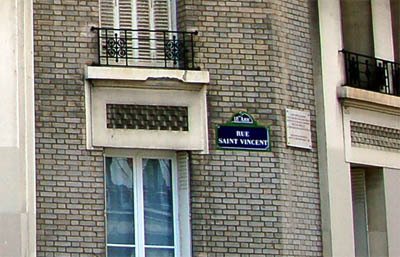 The building is on the corner of rue Saint Vincent and rue du Mont-Cenis (formerly rue Saint-Denis); the plaque which commemorates Berlioz’s home is on the right-hand corner of the picture (see the enlargement in the next photo). 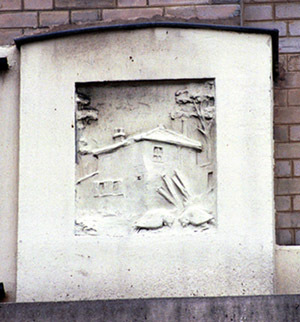 The commemorative plaque is on the side of rue du Mont-Cenis on the wall of no. 22. 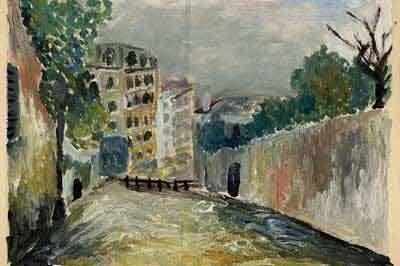 Compare this photo with Tourneur’s painting above, which shows rue du Mont-Cenis before the steps were built. No. 22 is the first block on the left of the picture. The page Montmartre was created on 26 June 2001 and enlarged on 1 August 2009, 1 February 2014, and 1 July 2016.